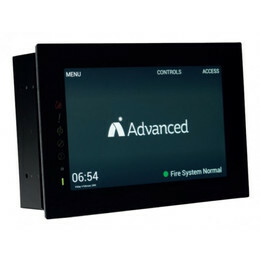 TouchControl is a 10", high-resolution touch screen Remote Control Terminal with active maps and zone plans. It is a fire panel and network node in its own right and works on Advanced's standard and fault tolerant networks. It is compatible with our MxPro and Axis EN fire panels. Zone information is presented via both the unit's colour coded, easy-to-navigate interface and the active maps that are easily configured using the Dynamix Tools Map App. Using TouchControl's colour-coded, easy-to-navigate interface users can: Evacuate/Mute/Silence/Resound & Reset View fires/ faults/ disablements/ alarms/ inputs/ outputs/ supervisory and network via ‘instant filters’ View/enable/disable zones View/enable/disable devices Enable/disable outputs by type Enable Walk Test mode Test display/zones/outputs/buzzer and LEDs Quickly access all zones in fire/fault/disablement/test via ‘instant filters’ and where allowed change status View 1,000 general and 500 Fire event log Set network time and date Users can choose from five pre-set background images or upload their own. The relevant zone plan to the unit's position can be displayed and users can run presentations on the display, which defaults to normal operation in the event of a fire condition or if the screen is touched. TouchControl enhances public areas and provides new levels of control and oversight. 2 Part enclosure for easy first fix and slide-in installation.